It must be summer for me: two movie reviews in just a few weeks! Another really good movie, too, this one an Academy-award-winning documentary. If you love an amazing story that serendipitously weaves together continents, champions the underdog, and echoes the resonance of truth across cultures, Searching for Sugar Man is for you! Sixto Rodriguez is the working-class son of Mexican immigrants to the USA. As an anti-establishment folk singer he published two albums in the 1970s about the marginalized poor of the inner city. The music is powerful and haunting, but his albums met with minimal success in the US, and Rodriguez was dropped from his record label. Unknown to the Rodriguez family, several of his songs became anthems of the anti-apartheid movement (“the system is gonna fall soon, to an angry young tune”), especially among Afrikaners. Rodriguez became a platinum-selling hero in South Africa, supposedly more famous than Elvis Presley or the Rolling Stones. He was widely rumored to have committed suicide on stage—bestowing Rodriguez with a Jimi Hendrix-like aura—yet people knew nothing more about him than what they could glean from his album covers and liners. In the mid-90s two men—record-store owner Stephen Segerman and music journalist Craig Bartholomew—decided to play detective and learn who Rodriguez was and what had become of him. They tried to contact his record label, but it had long ago gone out of business. They contacted the label’s owner, but he was of no help. They pored over the lyrics to Rodriguez’s songs, with not a lot of luck (they needed a cultural informant, as most any midwesterner or KISS fan could tell you that the lyrics from Can’t Get Away, “born in the troubled city in rock and roll USA,” refer to Detroit). Finally, they found the thread to unravel the story. This movie is the story of their quest. It turns out they found Rodriguez alive and well in Detroit’s historic Woodbridge neighborhood, having earned a B.A. in philosophy and having worked for several decades in demolition and on production lines. He became politically active, running for city council, and has three daughters. 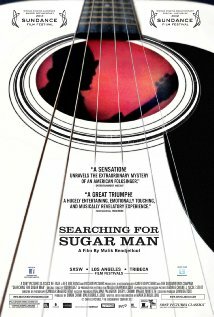 Segerman and Bartholomew arrange for Rodriguez to visit South Africa for a sold-out series of tours, and the movie includes footage of the first of those tours. Another interesting cross-cultural tidbit is that his youngest daughter, who accompanies Rodriguez on his first South African tour, falls in love and ends up living there. The way in which Rodriguez’s words, from inner city Detroit, speak to those on another continent and in another hemisphere, is very powerful. What is most remarkable to me, however, is the dignity, peacefulness, and clarity of the man himself. Rodriguez seems content with the life he has led (we never witness him expressing regret for lost royalties or fame), and joyous and yet non-phased by his fame and success in South Africa. It makes me want to meet a man so fully rooted in and confident of who he is.